Iconic baseball writer Bill James, in 1987, frustrated with MLB’s labor stoppages and the decline of the minor leagues, wrote that the minors “were an abomination … if you’re selling a sport and the players don’t care about winning, that’s not a sport. That’s a fraud … an exhibition masquerading as a contest.” Bill imagined a better model and proposed that, as opposed to limiting the number of teams in MLB to protect parity, a free market was capable of sustaining many more franchises — hundreds, even — if we would just allow it to sort out the level at which those cities might best compete. 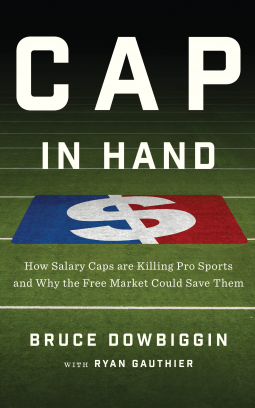 Cap in Hand goes a step further, arguing that a free market in sports teams and athletes once existed and could work again if the monopolists of MLB, NFL, NBA, and NHL would simply relent from salary-restraint schemes and reserve-clause models that result in elite talent being spread as thinly as possible and mediocrity being rewarded via amateur drafts and equalization payments. Cap In Hand asks: what if the four major North American pro sports move beyond the restrictive covenants of the franchise model? The product sold to fans today is a pale copy of what it might be if the market could guide the best players to the best teams, whose ingenuity and innovation would inspire everyone to do better and put on a better show. A solid argument for the removal of salary caps, reserve clauses, and other salary restrictions amongst the major sports leagues. Even if you are not completely accepting of this radical theory, you will gain some perspective on how the leagues conduct their business and treat their employees.